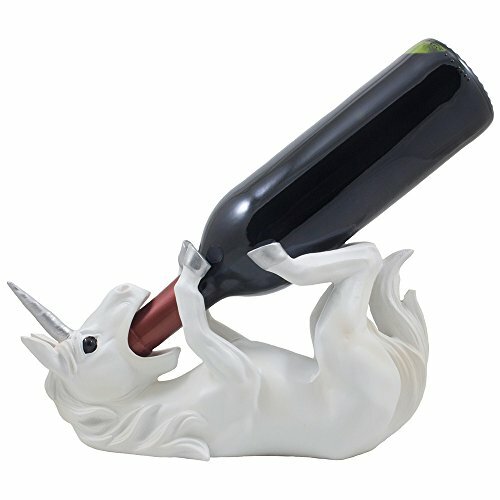 Always keep your favorite bottle of wine handy while dressing up your counter or bar with a mythical touch with the addition of this magical unicorn wine bottle holder. Beautifully carved and colored with golden tones and a silver horn and hooves, this winsome sculpture is certain to be a conversation starter at your next party or family gathering. This magical unicorn statue will bring a whole new meaning to any storybook fantasy involving this mythical creature that you may have read as a child! This decorative display stand will also hold oil bottles and most standard sized liquor bottles. Makes the perfect birthday or Christmas gift for wine lovers. Always keep your favorite bottle of wine handy while dressing up your counter or bar with a mythical touch with the addition of this magical unicorn wine bottle holder. - See full description below. Dimensions: 11" x 4 1/2" x 5 5/8" high. Weight: 2.6 lbs.